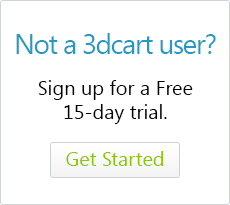 A feature that's unique to 3dcart is the ability to configure and sell your products in fractional quantities as needed. For example, maybe you sell networking and wiring components and you want to give your customers the ability to buy custom lengths of wiring. Perhaps you sell fabrics and you need to allow for specific lengths of material. With 3dcart, it's easy to set this up. First, you must add a product to your store. This article will assume you are already know how to add a product to your store. However, if you are not familiar with the process, please look at our knowledge base articles that detail the process of adding a product. When specifying the product's price, be sure to designate the price for the fractional unit of the product. For example, if your product is sold in yards, list the price that the product would be for 1 yard. Now that you've added your product, you're ready to designate fractional quantities for the product. This will be done on the product's Advanced tab under the "Price and Quantity Options" section. Where your shopper can enter any fractional quantity that they'd like. Where you shopper can enter any fractional quantity that they'd like, but the store will round them up to the next nearest fraction specified by you. Where the shopper can select only the pre-defined fractional quantities that you specify as the store owner. The easiest method to implement for fractional quantities, is Open Fractional Quantities. This means your customer can choose any fraction of the product they'd like. After adding your product in Step 1, proceed to the product's Advanced tab and look for the setting labeled "Max. Qty." To the right of the "Max. Qty." settings, you will see a checkbox labeled "Allow fractional qty." Marking this checkbox will allow the product to use any fractional quantities. 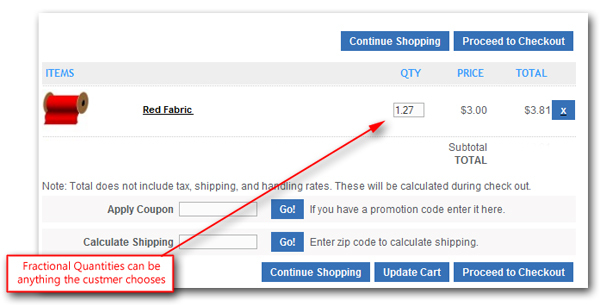 You can limit the maximum amount of the product that can be ordered by using the "Max. Qty." field. By simply marking the fractional quantity checkbox, the product can now be ordered in any fractional amount by your customer. Rather than allowing any fractional quantity to be used, you might need to have specific fractional amounts used where the customer can only choose whole, half or quarterly amounts. For example, instead of allowing a customer to choose 1.3 yards of fabric, you want to automatically round them up to 1.5 yards to make your inventory easier to maintain. To do this, go to the product's Advanced tab, and look for the setting labeled "Min. Qty." 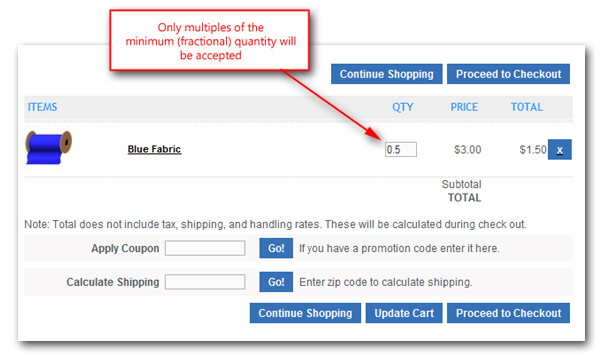 Then, to limit this as the base fraction, place a mark in the checkbox labeled "Allow only multiples"
In some cases, you might need to explicitly state to your customers which fractional quantities will be allowed for the product. For example, perhaps your product comes in pre-packaged quantities and you want to display the available product amounts accordingly. To do this, go to the product's Advanced tab, and turn on the "Allow fractional qty" checkbox as described already. Then, look for the field labeled "Qty Options:" and enter your individual fractional quantities here. Now, when purchasing the product, your customer will be presented with a drop-down menu specifying the individual amounts available for purchase.